Weather was glorious again today so sat on the beach with the grandkiddies and finished off my birdhouse which I have been making for the challenge over at The Shabby Tea Room. Using this photo for inspiration, create a card or project using soft blues, creams, whites and browns and/or with a house image on your design! This entry was posted on Sunday, August 8th, 2010 at 8:08 pm and is filed under Bird HouseStamping. You can follow any responses to this entry through the RSS 2.0 feed. You can leave a response, or trackback from your own site. Your birdhouse is SO sweet! I love the vintage look and adore the stamping. What lovely detailing you’ve added with your stitching and lace, and the rocking chair is fabulous, too. Thanks for playing along with us at TSTR. 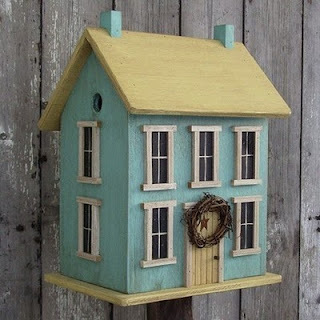 Wow, what a fantastic birdhouse Shirl, love it. Wow! You’ve been busy, love the details and the little rocking chair is so sweet. This is absolutely different from the normal squarish, straight edged houses. Love that curvy roof !